I’m so excited that my novel written at NaNoWriMo in November 2009, is finally taking shape. I’m into the heavy editing stage and the holes are gradually being filled in. When writing this book in 30 days (actually, I wrote it in nine days – don’t ask), I had several takes on different scenes. I’ve been busy “killing my darlings” and choosing the best scenario – sometimes out of three or four – for my book, and while I’m still figuring out how to connect certain dots (for example, how did my heroine know where to find “Fat Lennie?”). That’s something that both she, I and Fat Lennie are trying to figure out. But we’ll get there, I know. In the meantime, due to my insane brain deciding that my heroine would have to spend the better half of her journey in a fictional seaside resort in Maine, complete with a fictional lighthouse, and given the fact that yours truly has never been to Maine (although I’ve lived in many seaside towns – including Sydney, Southend-on-Sea, and Los Angeles), I find myself now at the stage where despite the Interweb and all its glories, it’s time for me to make that trip to Maine to check out its coastal towns and lighthouses. Yeah, yeah, I know Stephenie Meyer wrote Twilight without ever setting foot in Washington State. I know she decided on Twin Forks because she found it on Wikipedia. But I’m going a different route. I’ve always wanted to go to Maine, (which is why subconsciously I may have set two thirds of my novel there), so I’m going to go. You can’t stop me! But here’s the kicker. The coast of Maine is HUGE. There are more lighthouses than you can shake a stick at. I don’t feel the need to go to Maine just to tread on Stephen King’s hallowed ground, but I’m not going to complain, either So, I’m calling all Maine-ites, Maine-o-philes, or whatever you call yourselves to help me out. Do you live in Maine? 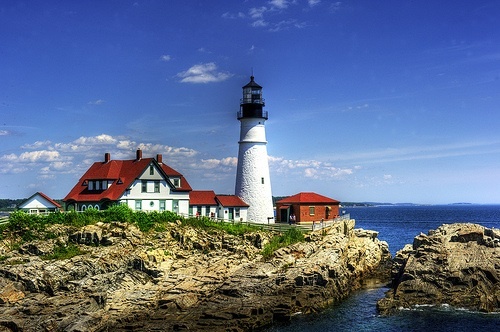 Have you visited Maine? Where’s the best place for me to go to soak up some small coastal town life and see some kick-arse lighthouses? My novel is set in a pretty tiny, remote-ish place. I’ll also write up my trip for my travel site, so it’ll be a twofer and I can enlist the help of the local CVB and get some media assistance. Maybe even a FAM (Journalist familiarization trip), but first I have to figure out where to go in Maine? Please send me your best suggestions for where I should go, when I should go, to soak up coastal towns, quaint B&B’s and lighthouse tours? As a kosher vegetarian, I don’t need to know where to find the best lobster (but thanks anyway). I’m happy with tomato soup and a grilled cheese sandwich. Michael – who will take you across to the lighthouse on his rickety boat if you’re nice to him. If you’re not, you’ll have to swim. Fat Lennie – Will NOT thank you. He plans to stay in Vegas, with occasional forays to Los Angeles. Otherwise, leave him the hell alone. Whither the Hawaii Writers Conference 2010? So does ANYONE know what’s up with the 2010 Hawaii Writer’s Conference (formerly the Maui Writers Conference). I’ve been squirreling away at my novel, with the intent to have it ready to present to agents in time for this year’s conference. I’ve always wanted to go and now have enough frequent flier miles under my belt for a free ticket to Hawaii. The conference is supposed to be held September 3rd through 6th, but the website’s certificate has expired, there’s no information on the conference and a Google and Twitter search found zilch, zip, nada. What’s up? The Conference Facebook Page has had zero postings since the 2009 conference and the only thing I could find was a posting by president John Tullius stating that Norah Jones pulled out of a concert for last year’s event and kept the $50,000 deposit that the HWC had to pay to her agents at CAA. As a non profit this may have been the death knell for the HWC, but I can find no information anywhere. Anyone have any clue as to what’s going on? I was so looking forward to attending but I fear that it’s not happening this year. What is odd, though, is that such a huge conference (not to mention their retreat) should have zero press on what is going on with them. I guess I could put in a phone call, but I fear I’ll just get a voice recording and I’m not yet ready to have my conference dream shattered. Anyone up for some investigative sleuthing?